# Peel the eggplants multi-colored. Rest them in salty water, then remove them from salty water and dry. # Make some cuts over the eggplants by the knifepoint. Pour some oil all over the eggplants. Place them into a cooking bag. # Place the bag into the oven which is preheated to about 375-390 F. Cook it, until the eggplants soften. # Meanwhile, prepare the filling mixture. Fry the thinly diced onions, until they turn into pink. Then, add lamb cubes on the onion pieces. Cook until the lamb cubes gives their broth and soaks again. # Add thinly chopped peppers, tomato paste and salt. Cook it for 5 minutes. Add thinly diced tomatoes and green peas. Cover the lid of the pot and cook for 15 minutes. # Remove the eggplants from the oven and place into a small baking tray. Make cuts lengthwise over the eggplants. You may enlarge these cuts a bit. # Divide prepared filling mixture into these cuts. Mix the sauce mixture in a bowl and pour it all over the eggplants. 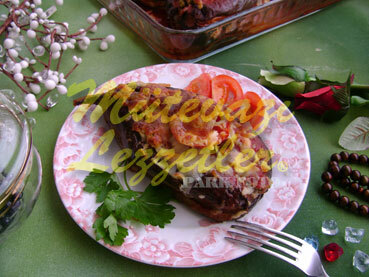 # Place the tomato slices over the eggplants and sprinkle kasar cheese. # Place the tray into the oven which is preheated to 375 F. Cook the meal until the cheese melts. Note: Garden Kebap may be cooked in a pot also.